Nepal has quietened down for the winter period. Our main obstacles to progress at the moment are the power shortages, known as "load shedding", which involve cuts of up to 14 hours a day. Many businesses and individuals circumvent this problem by running their own generators, although the fuel for these is not always available. However HART does not have this facility. 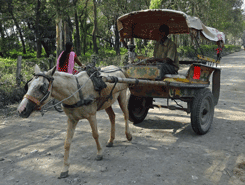 While Dr Lyon and Dr Cole were with us in November, we took advantage of their presence to hold a one day clinic for the benefit of the ponies and horses who pull the Tonga carts that are used for transporting goods and people in the Terai area of Nepal. The clinic was held in Sauraha, a town on the edge of the Chitwan National Park which is in the process of developing from a simple Tharu village into a tourist resort. In addition to the Tonga drivers and their animals, assessments and treatment were given to three camels and an elephant! All the Tongas attending were given reflective signs for their carts, to avoid a repeat of the night accident that killed one pony and driver, and the animals were treated as necessary. 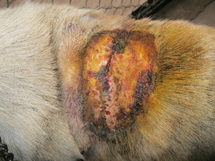 Each animal was de-wormed with Eqvalen that had been donated to Dr Lyon by Merial, the manufacturer. These clinics, as well as benefiting the specific animals attending, serve to increase community awareness of the importance of the health and well being of their animals generally. 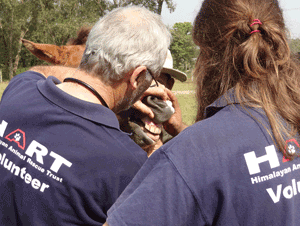 HART has been benefiting from the expertise and knowledge of Dr Andrea Turner throughout December and January. She offered her time and services to AHTCS during October and December and has now moved with the bulk of the staff to the base in Bharatpur where she and HART's vets, Dr Subash and Dr Narayan, are conducting a study into the potential problems of hypothermia during or after anaesthesia. It is hoped that the results of the study will enable us to further refine our operating procedures during the cold winter months. 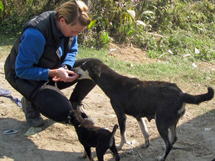 The Nepal Vet Council regulates that volunteer vets are not allowed to practise solo in Nepal (unless they hold a work visa) but nevertheless, their assistance and guidance add a very welcome boost to HART's range of activities. Lucky was picked up from the street as a small pup by a man named Devendra. After some time, Devendra went abroad and Lucky was left abandoned, back on the streets. As he is a good guard and an attractive animal the people in the area fed and petted him and he became a free roaming community dog. 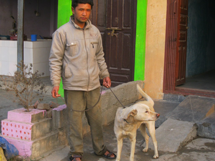 One community member, Narendra, is particularly fond of Lucky, although he does not confine him. However, when Lucky was attacked and stabbed, Narendra remembered hearing about HART and telephoned the office. 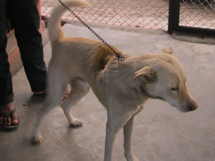 He was persuaded to bring Lucky to the clinic himself, despite initially requesting a pick-up. Lucky was treated and kept in HART's kennels for three days. He was released back into Narendra's care and Narendra will bring him back to the clinic for castration in a few weeks. There are many thousands of Luckys throughout Nepal and it only by assisting their own communities to care for them properly that the lives if these animals will improve. The third annual census was carried out in December, slightly later than usual but still before the end of the year. 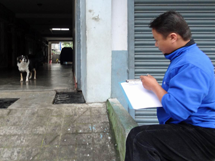 To reduce the load on resources, one third of the 18 Pokhara Wards were randomly selected and the dogs in each ward counted street by street. We are delighted to report that the results show a population that is stable. 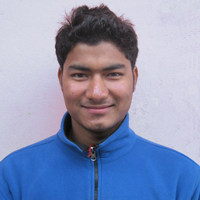 We are sad to lose the services of Bandhu Tiwari who has left to go to the Middle East. His animal handling skills were excellent and he was a pleasure to work with. We are very happy to welcome Subash Shrestha who has recently joined us in the post of Animal Handler. We are looking for any individual who can help us with fund raising in the UK. Our funds are used directly for HART's costs with nothing lost for admin or overheads. Fund raisers can become directly involved in how their money is spent and have a real influence on HART's work in Nepal.